It’s been fascinating to watch as Ava Inferi have broken away from their initial status as a side-project of Rune Eriksen to become quite a player in the Doom stakes. Rune’s decision to leave Mayhem in favour of this band is looking more sensible by the second, as their music becomes more and more sophisticated with each album. Onyx, their latest and fourth full-length, continues a run of success and proves the band’s ever-growing skill by being better than their previous best, 2009’s Blood Of Bacchus. It’s a very diverse and enjoyable album that naturally progresses from the band’s sound as laid down previously – progressive-tinged gothic doom metal, with the wonderful Carmen Simões on vocals – by being less straightforward. The flow is perfect, the songs are interesting and well-crafted, everything that I said about Blood Of Bacchus applies here too. This is an album made for music fans, by music fans; it could quite easily slip by as background noise if you’re not careful, so headphones, concentration and quiet are a must to get the full enjoyment. Every part of the album is of the highest quality. The Living End’s opening atmospheric morass is perfectly judged, moving seamlessly towards proggy doom rumblings and Carmen’s typically lovely wailing – joined by a male voice towards the end for an especially Goth Rock duet. A Portal, on the other hand, focuses on the metal, driven by riffs and backed by almost Industrial clanking that fits smoothly into their overall sound, soon opening into a gloriously uplifting section that’s right out of classic The Gathering’s playbook. Some tracks are more experimental than others – the strange Ghost Lights is full of little touches like whispering, whistling and samples (the latter of which especially could easily have backfired) and ends with a distant fairground tune. Onyx itself and Majesty, on the other hand, are more typical for the band, though still far from dull – the latter’s vocal ‘ooo-ooo’ing especially grand. I find it interesting that despite the addition of a second guitarist for the first time (Blacksunrise’s André Sobral) Ava Inferi have not piled on the heaviness, but been careful to enhance their sound gradually and subtly. If anything, it’s more notable on some of the lighter, more atmospheric moments, contrasted by adjoining guitars being allowed to slip free from the restraining leash that so often holds them back - The Heathen Island is a good example. Despite being quite doom (in atmospheric nature if not in actual heaviness) Ava Inferi are not really the sort of band that requires two guitarists to get their point across. The likes of Venice In Fog use creaking boats and melodic guitars washing across the sky like storm clouds to speak far more effectively than any extra grinding riffage could provide. 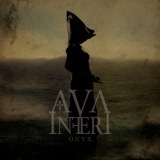 Ultimately, I was proven right yet again when I said at the end of the Blood Of Bacchus review that Ava Inferi have better to offer – Onyx is a stunning album, and easily the best and most beautiful thing I’ve heard this month. Taking an artistic, sophisticated worldview and making music that’s equally as grand and glorious, Ava Inferi have delivered twice in a row now on all their early promise, making it hard to predict what will happen next. Whilst I’ll hesitate to say that it will undoubtedly be better than this, I will say that I doubt it will be any less than Onyx’s equal.